Johannesburg - President Cyril Ramaphosa might be trying to solicit R1.2trn in new investment, but back home, the country is boiling over with industrial action affecting key sectors such as manufacturing, transport, healthcare and possibly the entire civil service. The winter months in South Africa are sometimes known as ‘strike season’ due to the inevitable number of wage disputes that occur most years. And 2018 is shaping up to be no different. Fin24 looks at the Saftu strike, the bus strike, the North West health services shutdown and the possibility of a public sector strike. In Johannesburg: Saftu will meet at the Newtown Precinct Park and march to the Department of Labour in Braamfontein, the provincial health department and premier’s office in JHB city centre. In Cape Town: marchers will assemble in Keizersgracht and march to City of Cape Town offices and then on to Parliament. In Durban: Protesters will march to the Durban City Hall, the Department of Labour and the offices of the premier and the mayor. There will also be smaller protests in Polokwane, Bloemfontein and the manufacturing strongholds of Port Elizabeth and East London. In a statement on Wednesday morning, meanwhile, government called on the conveners on the strike to ensure that chaos does not break out. The one year old union federation is demanding the minimum wage be raised above the R20 per hour agreement. It is also demanding the scrapping of proposed changes to labour laws, which will make it more difficult to strike. “Due to size and diversity of the metals and engineering industries it is extremely difficult to quantify the exact financial impact of the action on the sector," Steel and Engineering Industries Federation of Southern Africa operations director Lucio Trentini said in an email to Fin24. "If one were to assume a total industry shut down, the direct contribution of the sector to GDP will decline by approximately R17m per day, or indirectly by roughly R40m per day." The National Union of Metalworkers (Numsa) is Saftu’s largest affiliate with 300 000 members and the manufacturing sector is likely to be the most impacted by the one day shutdown. Trentini added however that firms have been aware of the action for some time and he anticipates that businesses have in-place contingency plans to mitigate the effect of the national stay-away. The three federations within the National Economic Development and Labour Council (Nedlac) Cosatu, Fedusa and Nactu, have distanced themselves from Wednesday’s strike, saying the R20 per hour minimum wage is a starting point towards a living wage and the new labour laws will not impact their right to strike. 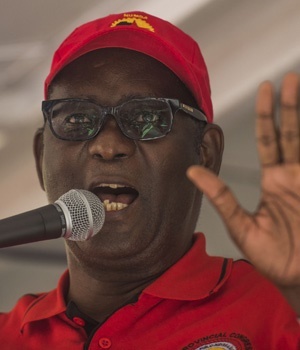 Cosatu sent a letter to members warning them to stay away from the nationwide strike, calling Saftu “an unprincipled federation which sounds radical”. The United Democratic Movement called on Nedlac to have broader consultation on the minimum wage as well as the labour law ammendments and include Saftu. The Economic Freedom Fighters urged all workers to join Wednesday’s strike saying that the R20 per hour minimum wage will “further entrench poverty”. The Democratic Alliance would like to see a policy adopted which would allow employees to opt out of the R20 per hour minimum wage and agree to work for less. The establishment of a National Minimum Wage formed part of the African National Congress election manifesto in 2014. The party welcomed the agreement of R20 per hour wage in November 2016, when it was announced by then Deputy President Cyril Ramaphosa. Bus drivers are demanding a 9.5% salary increase in the first year and 9% in the second year. They initially demanded 12%, while employers offered 7%. Interventions by the Commission for Conciliation, Mediation and Arbitration (CCMA) and Department of Labour have so far failed to break the deadlock. Nurses affiliated to the National Education, Health and Allied Workers Union (Nehawu) have been on strike since February in the North West, demanding bonuses be paid, improved working conditions and the resignation of North West premier Supra Mahumapelo. The shutdown in the health services were part of the reason people took to the streets in the province last week. The South African National Defence Force has been called in to assist with its military health unit. Nehawu vowed on Tuesday to intensify its strike and warned that members in other provinces could also join the industrial action, if their demands aren’t met. The unions jointly said on Tuesday that they’re edging closer to a strike and will embark on nationwide pickets from May 3. Unions' opening demand was for wage increases of the consumer price index (CPI) + 3% for junior government employees, and CPI + 2% for mid-level and senior employees. The Bureau of Economic Research predicts CPI will be 5.2% in 2018. Government’s opening offer was CPI +1.5% increases for junior employees, increases of CPI+1% for mid-level government employees and a hike of CPI +0.5% for senior government employees level 11-12.